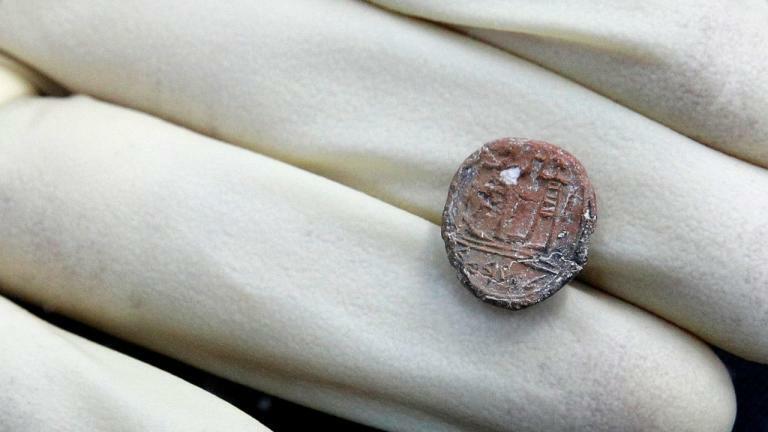 On Monday, archaeologist in Isreal discovered a 2,700-year-old seal that supports the Bible’s record of a governor ruling over the city of Jerusalem. The small clay piece is imprinted with a seal in ancient Hebrew that translates to “belonging to the governor of the city.” It is about the size of a small coin, like a penny. Archaeologists were able to date it to the period of the first Jewish temple because it was uncovered in soil from the first temple period. The artifact was found while researchers were examining the dust from a First Temple structure 100 meters northwest of the Western Wall. The site has been worked on since 2005, and has offered up insights into Jerusalem’s Second Temple and Roman periods. The seal was likely attached to a shipment or sent as a souvenir. It was discovered near the plaza of the Western Wall in the Old City of Jerusalem. “It is likely that one of the buildings in our excavation was the destination of this transport, sent by the city governor,” said Dr. Weksler-Bdolah. The impression on the artifact was studied by Hebrew University Professor Tallay Ornana and Tel Aviv University Prof. Benjamin Sass. According to their analysis, “above a double line are two standing men, facing each other in a mirror-like manner. Their heads are depicted as large dots, lacking any details. The hands facing outward are dropped down, and the hands facing inward are raised. Each of the figures is wearing a striped, knee-length garment.” Below this image, is the inscribed quote. The role of governor is referenced in the Hebrew Bible. First in 2 Kings, Joshua is listed as the governor of the city in the days of Hezekiah, and second in 2 Chronicles, Maaseiah is noted as governor of the city in the days of Josiah. “The Bible mentions two governors of Jerusalem, and this finding thus reveals that such a position was actually held by someone in the city some 2,700 years ago,” said Weksler-Bdolah. “Jerusalem is one of the most ancient capitals of the world, continually populated by the Jewish people for more than 3,000 years. Today we have the privilege to encounter another one of the long chain of persons and leaders that built and developed the city. We are grateful to be living in a city with such a magnificent past, and are obligated to ensure its strength for generations to come, as we daily do,” said Barkat.